Below are the most requested posts on Home Living. Many of them are listed on the left side. Dame of Sark This post includes a link to another post about Sybill Hathaway, Dame of Sark, during Nazi occupation. Her American husband was taken and put in a prison camp, leaving her to manage her kingdom as best she could. She decided the only way she could derail the enemy was by cheerfulness. The book tells of her amazing courage and creativity in the face of starvation, poverty, isolation, and lack of communication with the West. Don't Miss Out on Real Life - How pursuing education and careers delays marriage and childbirth. Protecting Our Daughters - Asks why we understand how to protect our most valued material posessions but fail to protect our daughters. Do What God Says Do, And Let Him Take Care of the Rest - Quitting work and fulfilling your responsibilities at home is largely a matter of faith. Charity Begins at Home - Young women who want to be missionaries need to be reminded that they are supposed to be preparing for marriage, and that their talents are needed most, at home. Keepers of the Springs, By Peter Marshall - Women used to be thought of as something too special to allow to be used as work horses in the market place. It took the 20th century to drag her down. Peter Marshall tells the devastating effects of feminism on women themselves. Taylor Caldwell - Women's Lib - Born in Victorian England, a famous author tells how women's liberation created less respect for women. The Effect of Architecture on Home Living - Modern home designs that drive women crazy and the advantages of the old fashioned Victorian style home. Those people knew something about home living that modern designers do not. The Wife, by Washington Iriving - How a wife responds when her husband loses his income and has to move to a lowly house, without their accustomed luxuries. When Queens Ride By - Made into a Loretta Young Show film in the early 1960's this is the story that never fails to lift you up. A woman struggles to help her husband on the farm, while her family does without good meals, a clean home. Things change after a conversation with a stranger whose car breaks down near the farm. How to Stop Worrying About Politics and Still Change the World - Does all this tension over the latest news drive you nuts? This article shows how you can do something about it without neglecting the home. Thirty Times Yes - This is the one called "Taking Time to Reflect" that everyone is always asking me to find, with the list of thirty things you should do at home before you consider going to work. Those things will never be done, so you can never justify leaving your duties at home and going to work for someone else. I hope to create a new post with things not listed in this article. For example, is your closet clean, with clothing arranged according to season or occasion, and do you keep a list of things you need? Is your sewing organized well enough that you can quickly find a needle and thread and button to repair a shirt? Could you put a meal together if someone comes over unexpectedly? The Formal Home - Should homemakers be made uncomfortable in their own homes by allowing just anything? How the casual can become a burden, and how a certain amount of formality at home makes the family more respectful and dignified. The Path to Maturity - Habits and vices (smoking, drinking, scoffing, partying, etc) will determine what kind of older woman you will become. The world is searching for the Biblical examples of womanhood. How can your youth effect the outcome? Will you be in training to be an example of goodness to younger women, or will you carry your worst habits into old age? The link to"Don't Miss Out on Real Life" does not work. Try the link again. I tried to fix it. Hear, hear! You have recommended a few of my personal favorites! I enjoyed Taylor Caldwell's piece so much, in fact, that I hunted down the book from which it was taken, "On Growing Up Tough". Another very worthy one, I think, is your post "Do What God Says Do, & Let Him Take Care of the Rest". I find myself repeating that mentally during particularly tough times. It does give me a sense of peace, & a will to continue. In my opinion, newer readers should begin with these very posts here. They are a good primer for those women who might be questioning their adherence to feminist thinking. Yay! Thanks for posting these old favorites. Especially Thirty Times Yes. As a younger woman, I was at a Bible study once where they were discussing if Christian mothers should work. The leader, an older woman in her 50's, said, "Well, some women are gifted enough to do both." That never sat right with me, because even as a young wife with no children, I was becoming aware of the potential of the home. There is no limit to what a woman can do to "upgrade" and build up her home, making it more beautiful, more efficient,more creative, more self-sufficient, more prepared for crisis, more ready for hospitality and service, more cozy, more able to reflect all the glories and virtues of the Lord! How sad when women invest their very strength in careers, where they can easily be replaced, when they could be investing all their gifts and talents into their homes, families and communities! There is so much more honor and reward on the home-centered path. THese days, this is the best-kept secret to happiness for women and families. I am getting ready to add links to blogs and homemakers. Please post your link on a comment if you want it added and please add me to your blog, too. I will also post pretty shops online, so if you have an enterprise or an etsy, etc. post it too. Effect of Architecture on Home Living" is also not working. Thank you a long time LAF reader. 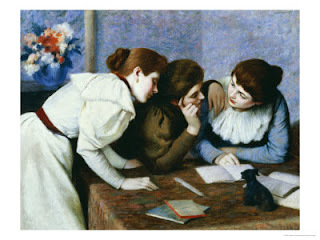 Love the sleeves and collars in this painting. It gives us an insight into the clothing of the times. That is similar to what I did today. I always go to the dollar store first, for what I need, just in case it might be there. I was very pleased that there were things identical to some things in high-end stores, that I needed. My next stop in WalMart and then the fabric store. I did not come home with much, but it is fun to go and see what is going on in the market place and see what creativity is being shown in the craft stores. I have some free paper crafts coming up, and and idea for a skirt. The stores were crowded and people were spending money. I didnt listen to any broadcasts all day, nor look at anything on the web as far as news was concerned.I will recognize change when I see it. In the meantime I can change a lot of things in my own world, at home. Thanks for fixing the link. Great articles. Thanks Lydia for sharing these, especially about architecture. Even my young daughters recognized this that something is amiss with the way the house we live in is designed. Thanks for the comments from the other homemakers it helps to see what others are thinking and that we are not alone. I used to say, "I do not need to read the news because the Bible tells me these things will happen." Lately I have been reading the news, way too much and it effects me negatively. I also loved your post(s) about the formal home. It tied in, I thought, with the theme of architecture affecting life. Anyway it got me thinking of the many ways that outside, physical things affect relationships and one's own interior life. I remember there being some controversy about the formal home, as if, gasp, any attempt to order one's home and life in a manner anywhere above that of pigs in a pen were somehow snobbish and un-American! Do you remember that little dust-up? I do remember. It was funny how the socialist girls came out and accused me of being inhospitable and uppity, just because I thought the home should be respected. I will certainly add it to the list. The girls who have spent their lives in state institutions from birth, beginning with daycare and into school and then off the college and then career, do not understand the privacy of the home.It is not open to the public or to public opinion. It is run by the parents and not by the public. THey have a right to close their doors to anyone that does not respect it. They have a right to require certain protocol. I get the same uproar from the ignorant ones , both deprived and depraved, whenver I post about manners. They call me a snob and insist that manners excludes people and so therefore that is not Christian. But the Bible does teach manners and courtesy. Let them rave and mock. It is an attempt to break down our niceties and our chivalry. It is an attempt to destroy everything that is good and pure and lovely. They do it by attacking anyone who wants to live above the world and trying to break them down. It is everywhere. THe homemaker is even attacked from within her home, as husbands come home with this hogwash from coworkers, or children parrot what they hear around them. The home is sacred. Women have the power to insist on manners and cleanliness and order. THey are obligated to do so. It is their duty and their responsibilty. But they should not be surprised at the conflict over it, for any time someone does something good, the naysayers come out of their dark corners and attack. They never build up and never produce anything worthwhile. THey live to shout people down. They will be old ladies with bitter personalities. Didnt I write something about that, too? Maybe I can find it and post it. Love is what motivates us to have good manners, order and decency. Just loving someone will make us desire the best for them. God is a God of order and we should be too. Well, then, it must have been an attack on love! Indeed, Lydia, you are correct; the naysayers do attack love!! They are so fueled with bitterness and a type of envy that pricks their conscience (which they promptly ignore and rebel against) that all they can do is mock and criticize; remember my husband's friend's wife who, a tourist from another country, was publically accosted in the US simply for taking that extra little bit of care in how she presented herself? Indeed, love motivates the desire to give of our best, and our best is to be based upon whatsoever is pure, of good report, uplifting, good, praiseworthy, as Paul puts it in scripture. There's a fabulous British writer called 'Colleen Truss who has written a humourous yet excedingly apt little volume on manners called 'talk to the hand', about the fall in manners and the need of manners and courtesy in order to have a pleasant, harmonious society. Manners are free. Please, thank you, treating another's home with respect, these all cost nothing and mean much. The industrial, institutional minimalist fashion of the early 2000's is finally giving way to something that is far more welcoming and far less 'factory floor'. This list is great - thank you so much for making it. (Yes, I also know it's you, giggle). It sounds like you have more guidance in your country than we do in the U.S. I think our Miss Manners is very good. She is secular, but is a bastion of respectability with loads of common sense. We need more of these people, and of course, we also need to be these people. Just wanted you to know I always enjoy reading your comments. Lydia, thank you for posting the formal home post and the path to maturity post. I appreciate the chance to re-read them. Hmm... There are still plenty of individuals on the airwaves (radio, television, and electronic) who would like for nothing else than a wholesale departure from manners and treating one another with decency and civility... Indeed, in many ways, the Australian national persona is one of the most uncouth in the world; grossly iconoclastic also (happy to throw out the good with the not so good) however, if one listens, voices such as those I've mentioned can be heard. there are plenty on ABC Radio who are that left they seem hellbent on advocating a fullscale abandonment of what those folk who I have mentioned stand for. Of interest, employers are noticing it among the younger generations, and 'not so young' - and it tells... I have my own theory regarding one contributing factor; I believe a generational addiction to using text message technology is literally speaking less - they thumb their noses at the very art of conversation. For a variety of reasons, I do not use text messaging and stand for good and polite communication. Folk truly need to ignore the eyes for a while, and focus on the ears! Enough of this adiction to the visual! Learn to speak, and when you do write, learn to do it properly, and know manners, decency, taking time to order one's home as haven and welcoming sanctuary and civility are not snobbery - and if the 'college girls' think they're the arbitors in this arena, I've got news for you - speaking as one who has spent a bit of time on university campuses, and has Australian friends whose children have spent time on student exchange to the US - said parents horrified with the academic bankruptcy re standards between Australian and US institutions in particular - and we're not speaking about a stagnant backwater, we're speaking of Berkley! but this is another topic for another set of comments on another post - incidentally, it makes it far easier for Aussie students when they get to the US... but that's enough for the naysayers to chew on for a while. I have passed on your web site to my daughter and some of her friends. So thank you for sharing again all these topics! Thank you for organizing your posts this way. It will make it easier to print them out for my notebook. I appreciate you allowing readers to print these inspirational posts out for personal use. I have finally found a good dress pattern for beginners. It is New Look 6352 and it can be a long, short sleeved dress or a long sleeveless dress. I am making the sleeveless version, but it is going to be a jumper as there is room enough in the armholes and collar to wear just about any kind of shirt underneath. I am also adding a ribbon tie in the back. I think you used this pattern with a different sleeve, which I will try next. I like this pattern because it is full on the bottom, not straight, and it looks elegant rather than utilitarian like most jumpers. It is far nicer than anything I have seen in the stores and the quality of the fabric and sewing makes it look quite expensive, though it is only cost about $15 to make, including the interfacing and pattern! I have figured out that I can save a lot of money by using my basic sewing skills and improving on them. Thank you for the encouragement. I think that is the same pattern I have used for all the dresses in this dress series. It takes any sleeve just fine and the neckline is not too low. It is loose enough but fitted and does not need a zipper or buttons. I do llike to sew more complicated things, but for this series I used an easy pattern. I added collars and trims and all the dresses look different.n I have one coming up that I will show for autumn, which I am sure everyone will like. I have so enjoyed rereading these posts. They are truely classics. I cannot however get Peter Marshall's Keepers of the Springs to come up. It is so inspiring to reread and think again on these principles. Reading them then sharing them with the younger generation is really what I need to be doing. I have found no other place except LAF that is so in tune with my feelings. How has the world drifted so off from the Bible's writings? To come here is like decompressing from the weary world we live in now a days. It gets you centered and the post like the one telling us to concentrate on our homes and not the let world guide or scare us is one I try to stay centered on. I agree with anonymous above ^ who comes here to be refreshed after becoming weary with the world. I've stopped reading or listening to the news because it is just so sad. I really enjoyed reading these older pieces.